William McGookin was the second son of William and Rachel McGookin and the brother of John and Margretta of Donaghrisk, Tullyhogue, Cookstown, and later of Blackhill, Cookstown. 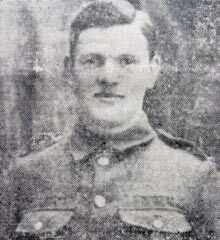 William was a member of Tullyhogue Company of Ulster Volunteers and a member of Derryraghan L.O.L. 131. Two members of his Company wrote to his home to say that they had seen William being hit by a bullet and he had died instantly.